Select Solutions is a specialist essential infrastructure services organisation, which provides metering, asset intelligence and integrated solutions to support gas, water, electricity, telecommunications, rail and government organisations and users manage and maintain their assets. As a division of AusNet Services, an ASX 100 company (formerly SP AusNet), Select Solutions, together with its associated group of companies, have been providing specialist services to electricity utilities, governments and commercial industrial customers for more than 20 years. Select Solutions provides diagnostic testing, condition monitoring and asset management services. These are all specifically targeted at electricity, gas and water infrastructure owners. Business owners can make informed decisions with the high-quality information we provide. We combine the expertise of leading engineers, technicians and chemists to provide varied services. Our asset management programmes can be individually customised for specific requirements. As a division of SP AusNet, we have the advantage of working on our own electricity and gas assets, making us qualified in providing meaningful and practical advice and information. 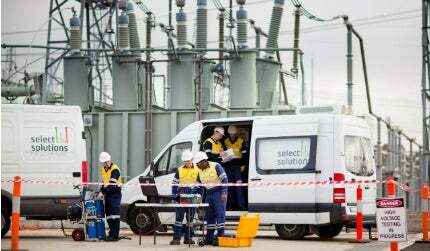 Our asset management services include high-voltage transformer testing and condition monitoring. This includes corrosion protection and non-invasive testing services. Non-invasive testing means that you do not encounter any down time, and can also find faults before they cause any critical failures. Techniques we use include thermographic scanning, corona surveys, partial discharge scanning and SF6 gas leak detection. We appreciate the criticality of protecting and maintaining network assets whilst also safeguarding our communities and the environment. These services include asset inspection, electricity field metering services, vegetation management, utility material provision, antenna site management and fibre leasing. Select Solutions can provide rapid responses using both aerial and ground-based inspections. We offer aerial patrols, routine cyclic inspections, hi-mast technology and drone inspections. Select Solutions also provides customised vegetation management programmes and can take the stress out of utility materials management. We also provide IT and telecom solutions, using our extra-high-voltage transmission towers throughout metropolitan Melbourne and rural Victoria. Select Solutions is an end-to-end gas and water services business. Our services consist of the development of meter asset management plans, meter installations and replacements, and specialist utility asset services. Our 20 years’ experience allows confidence for all civil plumbing works, general plumbing services, utility plumbing needs and water conservation programmes. We are also supported by a business support centre, which can assist in programme development, deployment and reporting. We provide customised offerings that encompass the entire metering chain. We presently manage more than four million utility meters in the residential market for electricity, gas and water retailers. Our services comprise the collection, processing and reporting of more than 20 million reads. We offer customer-regulated meter reading and meter provisioning services, including complete meter data management. Our field staff are qualified for electricity network new connections and sub-metering. Client services that we offer consist of asset investigations, national metering identifier and metering installations, registration number discovery, market transfer, and the commissioning of complex and current transformer (CT) new connections. UtiliView puts you in control. Our intelligent online portal is designed to capture and display information on energy and water consumption. The portal provides comprehensive levels of information on consumption patterns. This enables users to understand and review their energy and water usage. With this information, it is easy to introduce utility saving measures to reduce costs. In 2014 Select solutions acquired Geomatic Technologies (GT). GT offices, staffed by our highly qualified teams of professionals, are located in Melbourne, Sydney, Brisbane, Perth, Canberra and North America. GT is a recognised leader in advanced mobile and spatial technologies and is among Australia’s leading providers of IT integrated solutions and services. Our solutions portfolio includes solutions and services for mobile workforce management, asset capture and inspection, web mapping, including address validation and geocoding services, and solutions for data access, data management and data distribution. Through our membership of industry associations, and our close ties with research bodies including universities and government research councils, we continue to learn from the latest research. Our customers understand that the professional management and maintenance of their assets is fundamental to the efficient use of a company’s resources and operations. The Select Solutions approach is driven by results in providing cost-effective improvements to your business’ utility related needs. We can guarantee third party, non-bias results. We are industry accredited and work to all current standards. Established in 2009, Select Solutions is a large and diverse organisation employing over 1,000 people nationally. Our employees are the essence of our services, and so we take great pride in selecting and retaining the best in the business. Our commitment to our people was recognised with a Best Employer Award 2014 by Aon Hewitt, an honour given to only 16 companies in Australia and New Zealand, for our employee engagement, participation and leadership. Select Solutions specialises in delivering metering, data and asset management solutions across industries. We can also mix, match and bundle these services to provide a total service solution for your organisation. From asset inspection to electricity metering, condition monitoring to energy conservation and more, we can find the solutions to suit your needs. Each year, Aon Hewitt holds their 'Best Employer' Award Program in 9 separate global regions. This year Select Solutions has been announced as one of the top 16 companies, out of 120 competing businesses from across Australia and New Zealand, to receive accreditation as a Best Employer for 2014. Power transformers are a key element of power networks and therefore their periodic condition assessment becomes essential. The KivuWatt Project involves the construction of an integrated methane gas extraction facility and independent power plant in two phases. The project will extract methane from Lake Kivu to generate electricity.